[CZ] Napište českému prezidentovi, že jeho výroky na adresu Romů i jeho záliba v represivních opatřeních z éry komunismu jsou zastaralé a rasistické. Přečtěte si plné znění otevřeného dopisu, který prezidentovi poslalo Evropské centrum pro práva Romů (ERRC) zde. 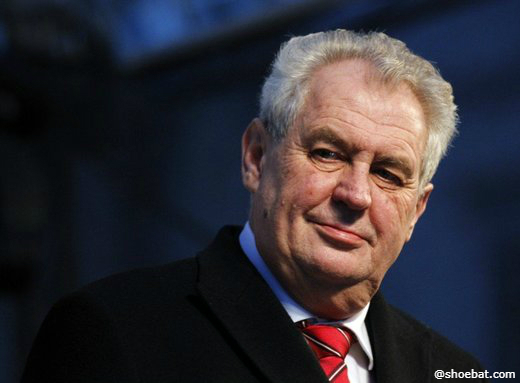 [ENG] Tell the Czech President that his comments on Roma and his fondness for the repressive measures of the communist era are racist and outdated. At a public meeting in Kojetin, the President declared that it was exactly clear who the 5% of unemployed are, before fondly reminiscing about the communist era when Romani people "had to work" and would be imprisoned if they did not: "Most of them worked as ditch-diggers, and if they refused to work, they were designated as work-shy and went to prison." Zeman went on to say that among the Romani work crews, if one guy didn’t work “they slapped him around. It’s a very humane method that worked most of the time." Read more about President Zeman's comments here. Read the full open letter the ERRC sent to the President here. Vážený prezidente Zemane, Chci tímto vyslovit své znechucení nad Vašimi nejnovějšími protiromskými výroky a zásadně se proti nim ohradit. Česká média zaznamenala veřejné setkání v Kojetíně, během nějž jste se nejdříve vyjádřil, že „všichni vědí, kdo jsou ti pětiprocentní“ nezaměstnaní, načež jste se ponořil do vzpomínek na dobu komunismu, kdy Romové „pracovat museli“ a pokud pracovat odmítli, byli uvězněni: „Většinou pracovali jako kopáči, a když odmítli pracovat, byli označeni za osobu práce se štítící a šli do vězení.“ Dále jste uvedl, že pokud se v romské pracovní četě vyskytl někdo, kdo nepracoval, „tak ho zfackovali. Je to velmi humánní metoda, a zpravidla se osvědčuje. Dear President Zeman, I am writing to protest and to express my revulsion at your latest anti-Roma outburst in which you declared that it was exactly clear ‘who’ the 5% of unemployed are. You went on to reminisce about the communist era when Romani people "had to work" and would be imprisoned if they did not: "Most of them worked as ditch-diggers, and if they refused to work, they were designated as work-shy and went to prison." You then went on to say that among the Romani work crews, if one guy didn’t work “they slapped him around. It’s a very humane method that worked most of the time." You have previously alleged that 90% of the ‘indaptables’ in the Czech Republic are of Romani origin. I remind you that the Czech Republic, along with 27 other Member States of the European Union, committed itself in 2011 to the EU Framework of National Roma Integration Strategies up to 2020. Your statements are blatant hate speech and directly fuel the vicious cycle of exclusion and discrimination of Roma. Your crude racist incitement and has no place in the European Union. Your abusive rhetoric, designed to stoke fear and racist resentment, poses a direct threat to democratic values and the security of individuals and communities. I declare my solidarity with those Czech citizens who call on you to desist and to resign from the office upon which you have heaped so much disrepute.